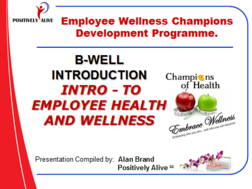 Target group: All employee wellness employees, workplace wellness practitioners, peer educators, community wellness champions and care givers, occupational wellness employees, HR Practitioners, health and wellness employees/committee members, - 3 full days. 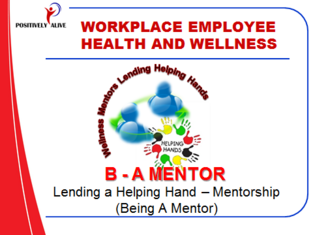 Provide learners with the knowledge, skills and behaviours to be able to assist their colleagues and the organisation to embrace health and wellness transformation. 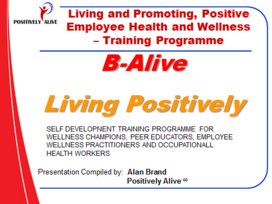 Applying the principles underlying critical thinking to create a paradigm shift enabling the learner to focus on a range of health and wellness topics and issues including chronic and non-communicable and infectious diseases affective wellness at work. Provide the learner with the knowledge and understanding of why people behave the way they do and how actions, beliefs and pre-programming influence who and what they are. The learner will be able to consistently improve their life and have a positive life changing influence on those they come into contact with this will include the ability to handle conflict and stress in there and others lives. 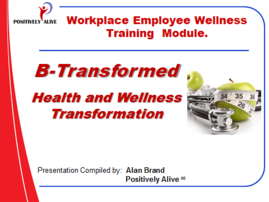 Target group: All employee wellness employees, workplace wellness practitioners, peer educators, community wellness champions and caregivers, occupational wellness employees, HR Practitioners, health and wellness employees/committee members, - 3 full days. Provide delegates with the knowledge, skills and behaviours to assist fellow employees in need. All the formal training modules are outcomes based and are aligned to unit standard.